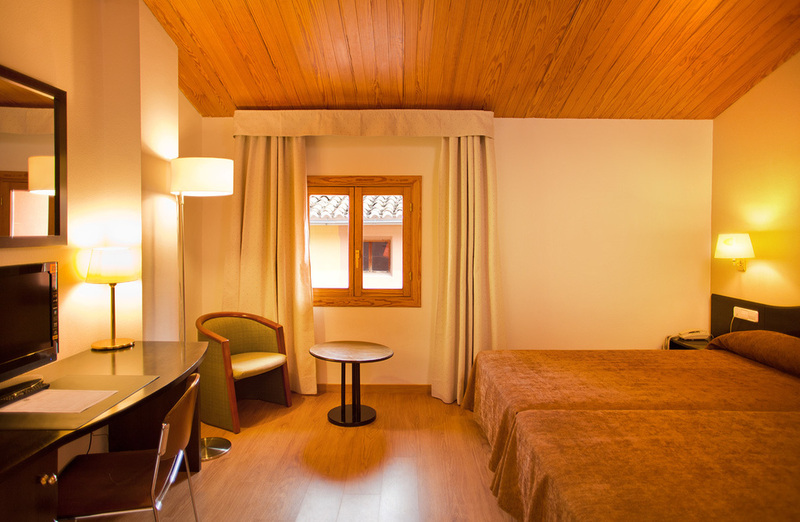 From 46€ per night - 40 rooms of 6 types. Standard Twin Room Equipped with air conditioning, heating, complete bathroom with bathtub/shower, TV, safety deposit box and Wi-Fi Internet connection. Superior Double Room Equipped with air conditioning, heating, complete bathroom with bathtub/shower, TV, safety deposit box and Wi-Fi Internet connection and courtesy minibar. Triple Room, equipped with 3 single beds. Equipped with air conditioning, heating, complete bathroom with bathtub/shower, TV, safety deposit box and Wi-Fi Internet connection. Quadruple Room, equipped with 4 single beds. Equipped with air conditioning, heating, complete bathroom with bathtub/shower, TV, safety deposit box and Wi-Fi Internet connection. Junior Suite Room, equipped with a double bed. Equipped with air conditioning, heating, complete bathroom with bathtub/shower, TV, safety deposit box and Wi-Fi Internet connection. Standard Double room equipped with a double bed. Equipped with air conditioning, heating, complete bathroom with bathtub/shower, TV, safety deposit box and Wi-Fi Internet connection.